Mobile is on every marketer’s mind at the moment. Last month, Google released their new mobile algorithm, nicknamed “mobilegeddon”, so now we all have responsive, mobile friendly stamped websites… right? In addition to this, Google recently announced that mobile search volume now outweighs desktop in many countries. This is a real turning point for mobile and just shows us how dependent we are on our mobile phones. I know I feel lost without mine! As marketers, we should be making the most of this growth. Despite this, so many marketers still insist that most of their conversions; be it sales, calls or form fills, come through desktop. In fact, many sites are seeing a drop in mobile conversion rate, but why? People use their mobile phones as a research tool. How many times have you been in a pub discussion and said “Let’s settle this”, whilst getting out your phone? Or how often are you out, need a taxi number and rely on your phone? The customer enters your mobile site and converts in the same session. Excellent! Job done, treat yourself for having such a well structured mobile site. Some customers use their phones on the go (I know, shocker!) to check the best prices and deals when in an actual store. If they then see the product they are looking for cheaper across the road, the first shop loses the sale and the second makes one through mobile. However, mobile is not attributed with this sale, even though it may not have happened without mobile phones. Google are working hard to make this data available. Currently, in the US, they are testing in-store purchases within the estimated total conversions column. Once again, the customers uses their mobile phones to research products, but don’t feel confident enough to convert on their mobiles for some reason, often security. It’s easy to tell if this is the case for your site. If you look at your data year on year and see; pages per session are down, session duration is down and first session conversion rate is up, then I would put money on the fact that customers are using their mobile phones to do research on your site. Google also has a column in Adwords called “est. 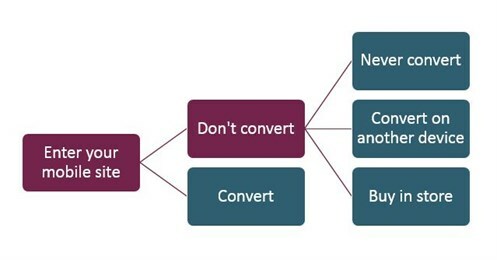 cross-device conversions” which allows you to see how often customers research and convert on different devices. However, this is only through PPC traffic. Oh dear … better test your mobile site usability. It is clear that, more and more, people are using mobile phones, and that a key use is as a research tool. With this in mind, we shouldn’t be so quick to dismiss mobile when its CPA comes in higher than desktop’s, or when its conversion rate is lower. For many industries, mobile plays an important part in getting a customer interested in a product. We should all make sure we get the most out of mobile.